DAVE M2 wrote: do you watch the ITV Motorcycle show? I just admit I find him irritating as well, but I'll watch anything about bikes and hope to learn something. The PR rep interested me best of all, my old RS wears a set of handlebars and a headlight out of the parts removed from the original F" models, like in that picture Colin Seeley showed Mr Cole, and my other just a headlight and I have a headlight and another set of bars stashed away. I well remember those pile of parts turning up at work and picking seemingly endless sets of tyres, lots of silencers and front mudguards, oh so many parts. When I went off for my op, which turned out to be my leaving, there remained only some indicators and footrests, left hand I think, tucked out of the way in a corner. Most of the remaining larger parts, seat, tanks etc having been scrapped or dumped in the 90's sometime and the remaining odds and ends, like handlebars/headlight brackets etc being disposed of somehow in around 2004/5 I think while I was not there, they were gone by 2006 when I went back anyway. 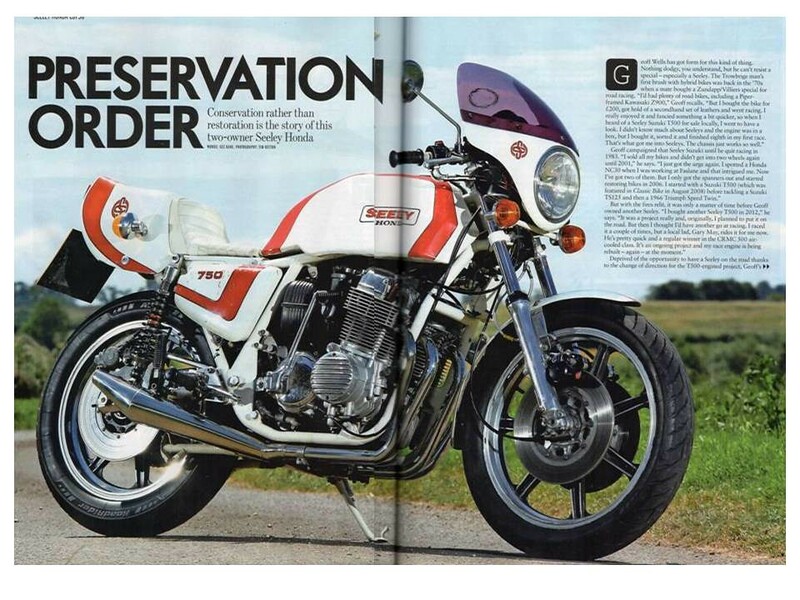 The feature on my Seeley Honda 750 was published in the October Classic Bike magazine. A good write up from Gez Kane. 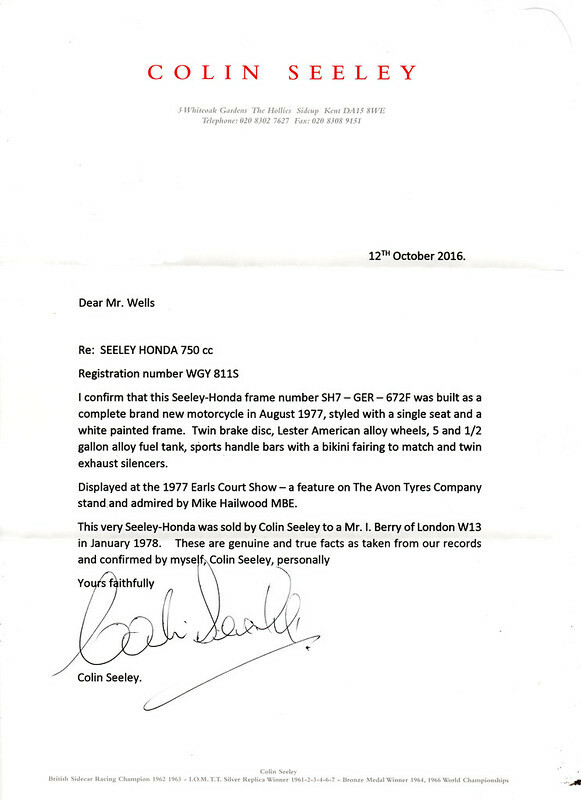 Colin Seeley confirms that only 6 bikes were "factory" built by CSRD so it makes my bike a pretty rare example. I must get a copy of CB this month, I've not bothered for ages as I barely keep up with my other magazines and being so short of money back then something had to give. I remember several moves ago we lived right next to a small car park ( 7 spaces) and one day a Seeley Honda was parked up there, had a nice chat with the owner who was impressed I was keeping my RS's going. 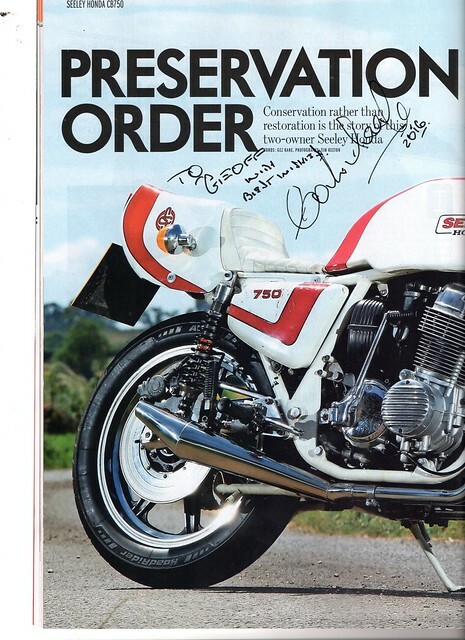 Colin Seeley was kind enough to sign a copy of the Classic Bike magazine feature for me. A nice addition to the bikes history, I think he liked the article too.